Testament are proof positive that sticking to your guns and never giving up will pay off in the end. The Formation of Damnation is testament (pun completely intended) to the skills and talent that this classic Thrash band have in abundance. With pure energy, belying their years, focused into 11 fearsome tracks their relevance in 2008’s Thrash scene could not have been made more apparent. Deftly balancing Testament’s Thrash past with their dalliances in Death Metal during the 1990’s (a necessity as Thrash metal’s popularity had nose-dived considerably), this album is sonically heavy rather than an all out thrash-fest but as modern Metal goes you’d be hard pressed to find anything better. The punishing “More Than Meets The Eye”, the emotionally provocative “The Evil Has Landed” and the skull-crushing Death/Thrash title track all feature the crushing riffs and exhilarating leads you would expect from a Testament record but their jewel in the crown is still Chuck Billy’s unique versatile vocals. Ranging from a throaty, thrashy rasp to a concrete-gargling growl, The Formation Of Damnation showcases the big man’s talents for extreme yet audible vocals and this album was an astonishing return to form from a band who could so easily have thrown in the towel during the thrashless ’90s. 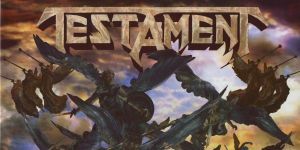 The Formation Of Damnation is good enough to stand toe-to-toe with the greatest records of the genre and if ever a case for The Big 4 finally welcoming a fifth member was to be made, then Testament are the band that are ready to plead guilty. Fellas, your time has most definitely come.